A little while ago I was tagged by Joanne (she blogs at Opposable Thumbs) to share the contents of my makeup bag. 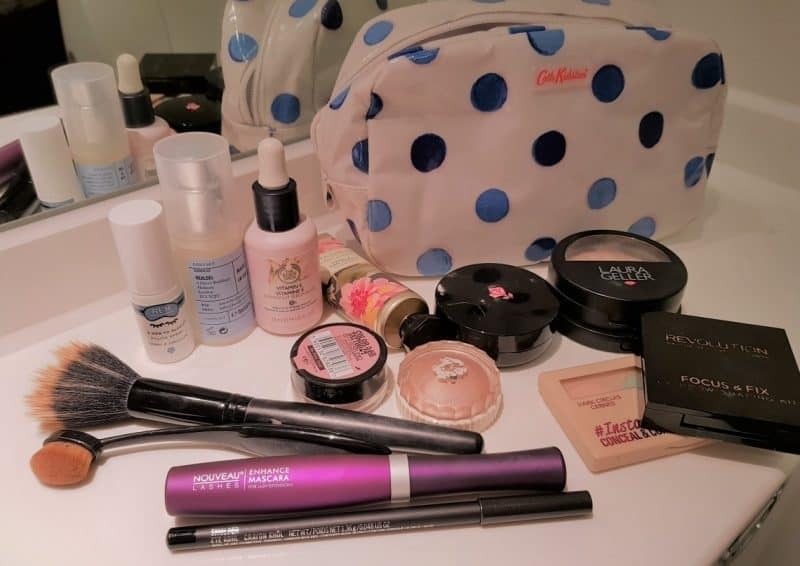 Now this isn’t my everyday makeup bag but rather my ‘weekend away essentials’ though in fairness it this is what’s on my face most of the time, a lot of what is in my makeup collection at home doesn’t get much use! 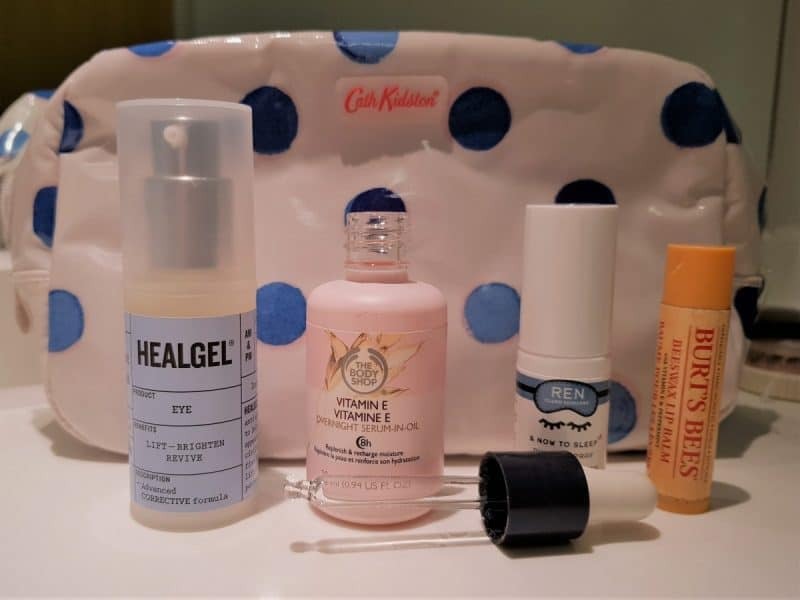 Skincare: Healgel Eye – this is the best eye gel I’ve ever tried, perfect last thing at night and in the morning to combat puffy eyes, plus I have really sensitive eyes and it’s never caused my any grief. In the interest of full disclosure I was sent a Healgel Eye three or more years ago to try but this is probably the fourth little bottle I’ve purchased – true convert here! I then use The BodyShop’s Vitamin E Serum-in-oil on my face before bed, sometimes with a moisturiser on top if I’ve got really dry skin but at the moment that’s not necessary. I always have a lipbalm in my bag when I’m away as I find hotel air con really drying, and Burt’s Bees are always good. The REN ‘& now to sleep’ spray is a new addition as it was a free sample but I love the heady scent on my pillow, plus if I’m in a hotel falling asleep is normally preceded by two annoyingly excited kids leaping around and refusing to lie down for an hour or so. Onto make up, for my face I use ‘Balance n Brighten Baked Color Correcting Foundation’ by Laura Geller, which was a present from my mum and I was really not keen on trying as in my mind foundation comes in liquid form in a tube (well, once I stopped using ‘dream matte mousse’ in my teens!) BUT I really like it! I buff it in well with a brush and as long as I have no dry or flaky patches, plus it seems to last forever too! The other powder here is a long discontinued blusher from ‘dainty doll’ but it is perfect for lightly contouring, and I really need to find a dupe of it, probably from Mac. 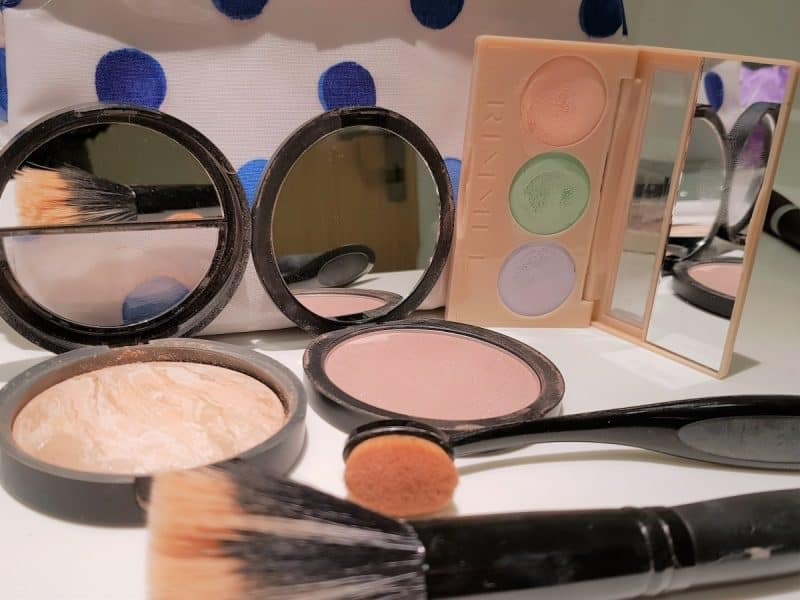 The Rimmel palette at the end is a concealer trio, with three different colours for three different things, the green to combat redness which works well but you have to go really carefully with, the normal skin sort of shade for dark circles and the lilac for brightening dull areas. I tend to use cream eye-shadow these days as I find it stays put a lot longer than powder, plus I don’t get fallout that irritates my eyes. On the left is a Benefit oyster pink, which is my every-day go to, and the other one is a Maybelline Colour Tattoo 24hr in Rose Gold, which is a gorgeous colour but I don’t really wear it as an every day colour, it looks really good with flicked eyeliner too! 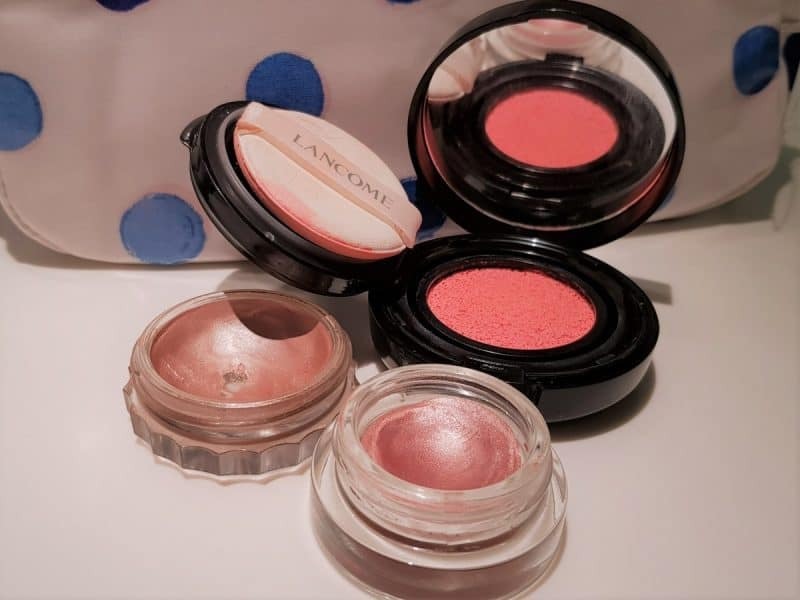 The Blush is a Lancome Cushion Blush in Rose Limonade, which looks excessively pink but needs a lot of layers to look that pink on your skin. It stays a lot longer than a powder blush too, but it’s so pricey I doubt i’ll buy another when this one is finished! It was a slightly pushy counter-lady that made me do it! Lastly eyes! When I’ve not done my eyebrows with the Maybelline Brow Tattoo I powder them in with the Makeup Revolution brow palette, using a combination of the two darker colours plus the wax to keep them in place! I was sent this mascara from Nouveau Lash to try out which is designed for lash extensions but works well on natural lashes too. 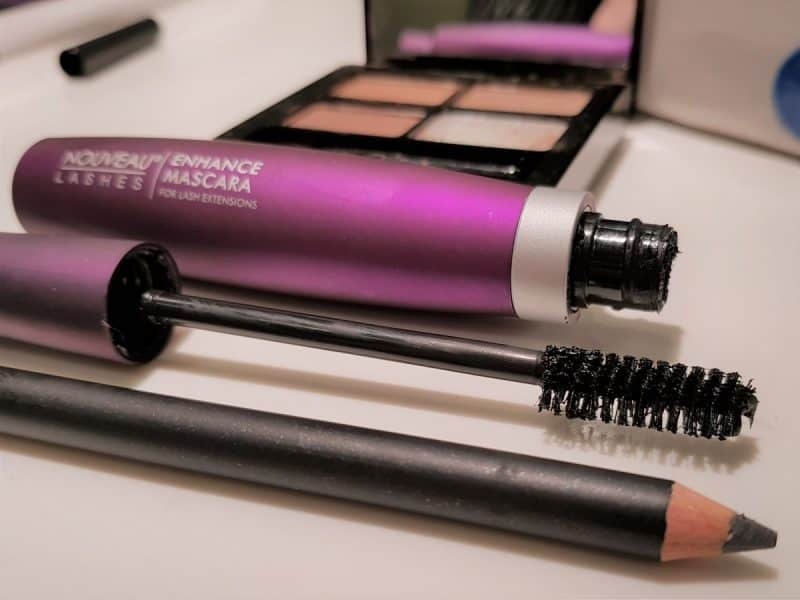 I really like the brush as it has shorter bristles on one side that I find perfect for the lower lashes and then longer ones on the other side, great for adding length and volume. It’s comparable to Lancome Hypnose which is what I normally use, but about five pounds cheaper. Lastly the eyeliner is Mac’s Eye Kohl in Smolder, another purchase with my Christmas gift card but to be honest it’s a bit too smudgy for me starts to migrate under my eyes by mid afternoon! The search for the eye pencil that doesn’t budge continues! 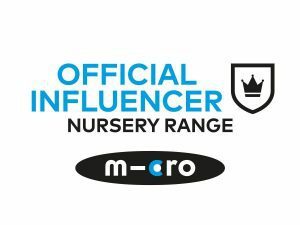 I was sent the Mascara featured in this post though had no obligation to feature it in a post and everything else featured is my own. Oh hello to that eye gel! My eyes are quite sensitive so it sounds perfect. What a great selection! I also decant my current faves for a weekend away. It’s also a good time to use up samples, I find. I like the Maybelline Colour Tattoo 24hr, I find Maybelline always have a huge selection of make up to suit everyone. The Brow Tattoo is absolutely amazing! It’s really nice! I especially liked how you mentioned the normal skin sort of shade for dark circles and the lilac for brightening dull areas.